Origin: Zebes test subjects transplanted to Tallon IV by Space Pirate interventions. 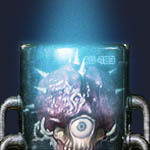 Shortly after hatchling from a Metroid Egg, hatches into an almost jelly-like creature. Geneticlly different from it's original Zebes strained relatives, these differences are apparent at birth. 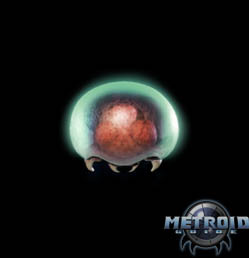 Overall pressures of Tallon IV's atmosphere have caused the Metroid to actually grow slightly larger in size. It's outer carapace, though still soft in it's larval form, is 180% larger in mass. The growth of mass aids in the infants ability to store access energy. This adaptation did not go unnoticed by Space Pirate scientists, which ignorantly used them as "living batteries" of energy. It was later learned that exposure to Phazon would cause them to genetically grow rapidly and unexpectedly. 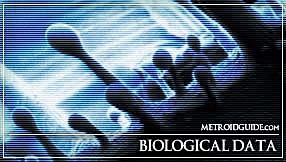 This accounted for many early casualties in Space Pirate forces during the begining stages of the new Metroid breeding program upon Tallon IV. An interesting thing to note is that this Tallon IV strain of larva was also abnormally docile during it's infant stages. This led to the false expectations of keeping some as pets among the Space Pirate forces. However, much like their related larval cousins, this instinctive "companionship" drive is suppressed in time only to be replaced with the overwhelming urge to feed. Shortly after the dried husks of Space Pirate crew members where found, this policy of pet keeping was quickly dissolved.